Junior Murphy Carlson works at her desk, creating jewelry for her customers. This is Carlson's first business and she runs it herself while being in school and extracurricular activities. 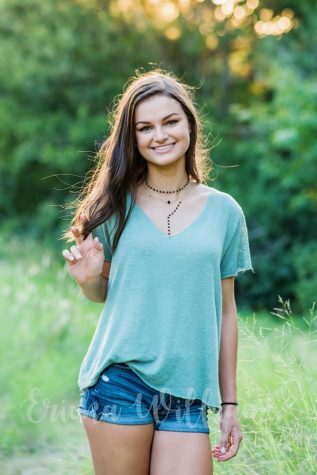 Along with balancing academics and extracurricular activities, junior Murphy Carlson has managed to create her own online jewelry business. Carlson sells a wide variety of styles of handmade necklaces and bracelets internationally. Carlson first began creating jewelry in April, selling her jewelry mostly to friends. During this time, she decided to work her first job at a restaurant. Not enjoying her job, Carlson decided she wanted to find out how to independently make money. Carlson decided to sell her collection of jewelry, and launched her jewelry business, Murphy Carlson Jewelry, on July 14. During the summer, Carlson experimented with creating websites and ended up creating her own. Carlson posted her jewelry on there and began to expand the website by adding names to her jewelry and creating different sections for necklaces and bracelets. Before creating her business, Carlson was not interested in jewelry and said she hardly wore it. But what inspired her into creating the jewelry was her interest in arts and crafts. Carlson poses for a photo wearing her jewelry. This is one of the pictures from a photo shoot featuring her jewelry. While working on creating her jewelry line, Carlson had a job at a high-end jewelry company, Catherine Page Jewelry, where she learned new ways to create jewelry and new skills to transfer over to her designs. As Carlson acquired more skills and expanded her business, she created a process for creating and selling the jewelry by coming out with arrivals every other Saturday and making duplicates of each piece of jewelry. While her business is a priority, she still manages her time for homework and hanging out with friends and family. Despite Carlson having to put her business in front of her family and friends at times, junior Sydney Demski said she is proud of what her friend has accomplished. Along with Demski, Carlson’s father, Arne Carlson, said he sees the business as a great opportunity for Carlson. Despite her initial concerns about the business, Carlson has been able to grow internationally through many advertisements. Thanks for this amazing post, this really takes making money online niche to the next level and can help anyone become a pro through inspirational write-ups like this, if they put in a little work.